I am sticking with the mixed berry theme which I am very fond of this summer. Amazingly it does feel like we had some summer already this year! Which is quite rare for this part of the world…. 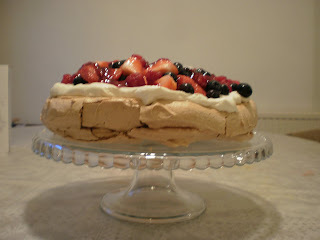 This Pavlova comes from the delightful Barefoot Contessa whose recipes I love. Strangely enough I do not have any of her recipe books (and I have lots of those), I just watch her shows on the food network and get the recipes from the food network website. Which is the case with this recipe. This is deceptively light-tasting, the meringue is very thinly crisp on the outside and wonderfully soft and chewy in the middle and if you turn the meringue upside down when you take it out of the oven, and pile the cream on the flat side the soft cream melds with the chewy meringue. The great thing about pavlovas is that they are very easy to make, minimum effort, a great dinner party dessert in my opinion. My husband found it very easy to put multiple slices away though so I wouldn’t necessarily follow the guidelines on how many it serves…. I usually adapt recipes and it was no different with this one….I used Nigella Lawsons' instruction on temperature and timing in How to Eat as I was originally thinking of making her passion fruit pavlova. I reconsidered as I was not sure about the whole passion fruit pulp with seeds-I felt the crunch of the seeds would interfere with all the soft gooey chewy-ness. I may be wrong. 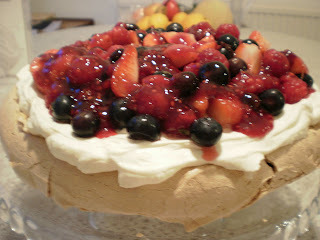 Has anyone tried this pavlova? Besides I had some berries in the fridge that needed using. However I felt her cooking instructions would produce a more gooey center, so I preheated the oven to 180◦C and then turned it down to 150◦C as soon as I put the meringue in and then cooked it for 1 hour and 15 minutes and then turned the oven off and left the pavlova in the oven until it had cooled. I suspect Barefoot Contessas instruction produces a thicker crisper crust. I also used 300ml of cream as that is the size the tub comes in and it worked fine. For the sauce I just mixed a couple of tablespoons of seedless raspberry jam with water and some strawberry syrup I had with a handful of crushed raspberries, this also worked fine but in truth I think you could do without the sauce altogether. Apologies for the not so great pictures-they were taken hastily with my old camera as we were in a hurry to eat!